The PKK is labeled as a ‘terrorist organization’ by the United Nations, the European Union and Turkey. The PKK started their armed struggle in the 1980’s and they fight for the rights of the Kurdish people. Turkey is a member of the NATO and that is why the world turns a blind eye on what is really happening in Turkey and occupied North-Kurdistan (East-Turkey). The Kurds are not allowed to be educated in their own language. Kurdish children are forced to sing ‘He is proud to calm himself a Turk’ and have to sing the Turkish national anthem. East-Turkey is kept poor and the Kurds live in bad conditions. 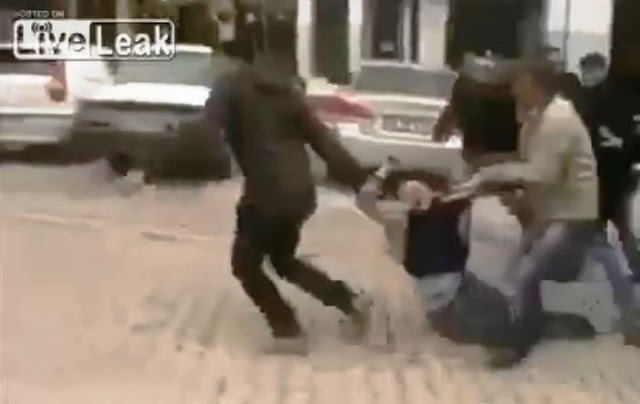 You will see the the true face of the Turkish nation and the Turkish government in this video. Kurdish civilians are tortured and murdered. 02:20 – A Kurdish kid is trying to awaken his mother. His mother was seriously injured (and probably murdered) during a demonstration. As you can see, his mother does not respond and everyone else is busy taking care of their family members. 03:15 – Bodies are dragged away by the fascist Turkish police. 03:20 – Three ”brave” Turkish police men are dragging a 10 years old Kurdish kid away. They must feel really though! 03:30 – More than 20 Turkish soldiers and police men are kicking one Kurdish protester. 03:43 – A Turkish police officer breaks the arm of a young Kurdish boy. ng the Kurds and this is why the PKK fights against the terrorist Turkish government. Don’t let them brainwash you. Think for yourself! The Kurds have been treated worse than this. Not only by the Turks, but also by the Arabs and Persians. More than 182,000 Kurds were buried alive in the late 1980’s by the Ba’ath regime of Saddam Hussein. Turkey is supporting Palestinian terrorists, Islamic Terrorists, the terrorists of FSA in Syria, they say that the Taliban are freedom fighters. But according to these hypocrites, these fascists, the PKK, which is a socialist atheist movement (half of the PKK fighters are women), is a terrorist organization. The Turkish state is the true terrorist! Turkey massacred 40 Kurdish civilians, including 19 children. There excuse for this massacre was ”they mistook them for terrorists”. The children were smuggling small cigarette packages from ‘Iraq’ (South-Kurdistan) to ‘Turkey’ (North-Kurdistan) to help support their family. 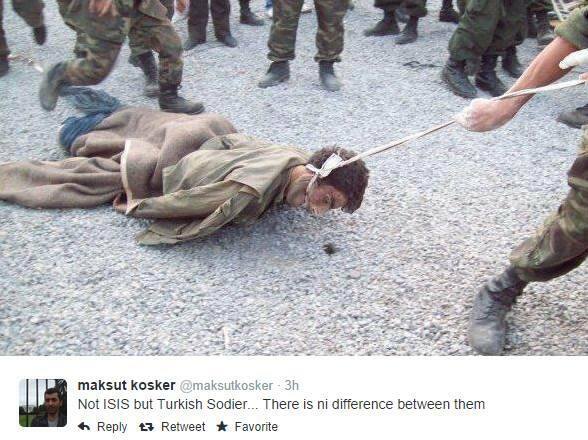 Kurds in South-Eastern Turkey (North-Kurdistan) are treated as second class citizens. They are not allowed to give their children Kurdish names, they are not allowed to be thought the Kurdish language, they are forced to swear loyalty to the Turkish flag and call themselves ‘Turkish’ rather than ‘Kurdish’. The Kurdish areas are extremely underdeveloped and kept poor. The Turkish government steals all the natural resources in South-Eastern Turkey (Kurdish inhabited areas), to develop the Turkish (touristic) areas. The Kurds do not benefit from this. The PKK took up arms to fight against this oppression and discrimination. Turkey, the United States and the European Union label the PKK as a ‘terrorist organization’. The PKK consists of 5,000 men – 2,500 of them are women fighters. The PKK does not only fight for equal rights for the Kurds, but also for equal rights for women and all other minorities in Turkey. They target the Turkish military and politicians, while the Turkish government has committed many massacres throughout history (Dersim Massacre, Armenian Genocide are only 2 of those massacres). Yet the USA & EU label the PKK as a terrorist organization, just to please their Turkish ally. Please spread this video so people know more about the Kurdish issue in Turkey. People need to know about the Turkish oppression and discrimination of Kurds.